Get free shipping at Harry and David with purchase of $48 or more. What's better than their selection of fine chocolates and fine fruits than chocolate covered fruits! Check out their suculent pears and mouth watering cherries dipped in that perfect rich creamy complement of chocolate. Get the sweet details at http://www.harryanddavid.com. 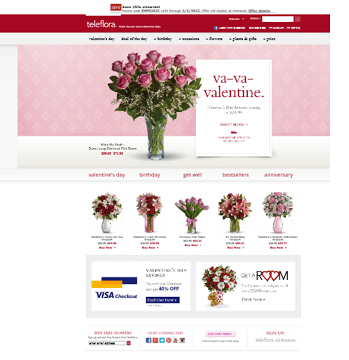 There are two ways to save big at Teleflora. Pay with Visa Checkout and get 40% off. Use promo code EMP0202C to save 25% off.